This week or so was pretty much uneventful until yesterday, which I will get to soon. Why? Just because I meant to do that since I’m getting conscious (sorta) of what I’m eating since I joined a gym the past two weeks and I’m thinking to myself, I shouldn’t eat that much or I’m working out for almost NOTHING. So, I’m trying to limit myself as to something “interesting” for you guys to read about what I’m eating. I know, it’s a shame as a food blogger that I’m doing this to myself and in the end, you. But I’ll get over it once my birthday and the holidays roll in, where I have absolutely almost no guilt into eating a TON of food to my hardened, cholesterol-clogged heart. Also, I have to tell you a little side note is that I acquired myself a new lens for the interior/zoomed out food photos so…from these photos on, it’ll be this lens instead of my dinky little kit lens since I’m fed up with the blurry, low-lit photos that look like utter crap! You’re getting more for your viewing pleasure. But I’m still using my usual macro lens for close ups. It looks somewhat healthy, right? I mean, I think it’s relatively healthy instead of eating half a pound of butter (each) that is found from the copious amounts of pastries that I normally would consume from them. 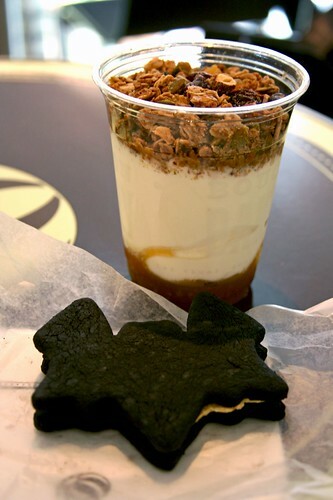 I just have their granola parfait and their TKO cookie. The parfait looks healthy but it’s quite decadent. The yogurt is very thick like Fage‘s Greek yogurt. It’s tart and very creamy. The crunchy granola also contained pumpkin seeds, both dark and light raisins, and I think there were dried cherries as well. The bottom layer is what I think is lemon preserves or jam of sorts since it’s translucent. It’s tart, lovely lemon flavor and as I’m thinking back on this, it might be Meyer lemon. Hmmm… The bottom layer is orange marmalade. 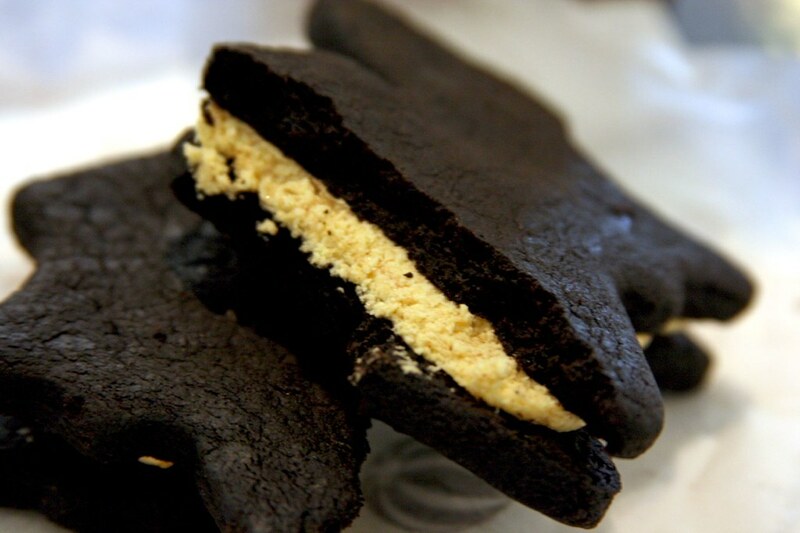 The TKO cookie is a seasonal or holiday version of the normal. It’s meant for Halloween, hence the bat shape and it’s filled with pumpkin cream. Mmmm…tasty. The chocolate cookies tastes buttery and chocolatey, while the pumpkin cream was nicely spiced with nutmeg, cinnamon, and ginger. I seriously have to stop coming here…even though I like their stuff a lot. For the remainder of the week, I ate “blah” food. As in something so diminutive to you people that you won’t be interested or it’s just doesn’t taste that awesome that I don’t want to bother with writing. 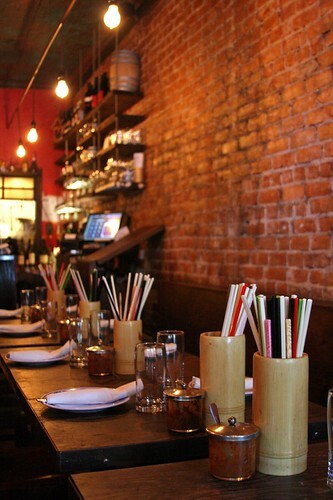 So, we fast forward to yesterday…I ate with people! Not just the usual bunch (e.g. Robyn, Ariel, etc. ), I ate with my fellow reader, Jessica and her friend, Adam, while I just invited Ariel for the sake of him trying out this place with me. 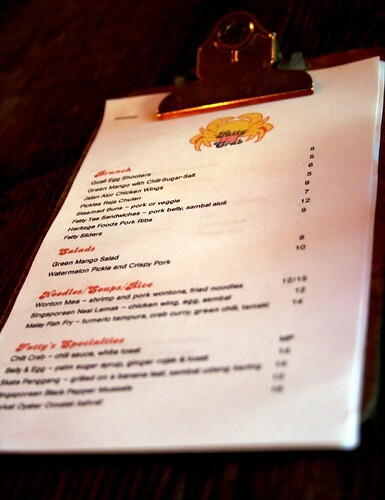 We all meet up at Fatty Crab for a late brunch or lunch…or whatever you would call it at 2 PM. Since I arrived earlier than the rest, I took a good bit of photos of the interior. 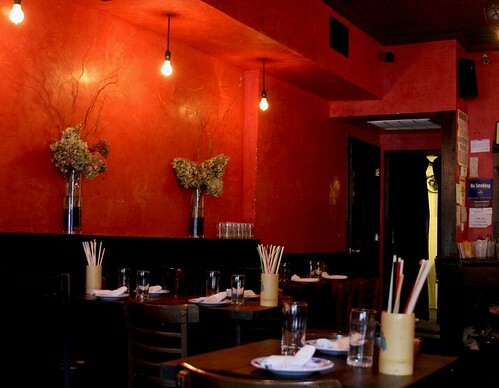 It’s quite casual with the dimly lit, exposed brick on one wall, while the other is emblazoned with bold red. 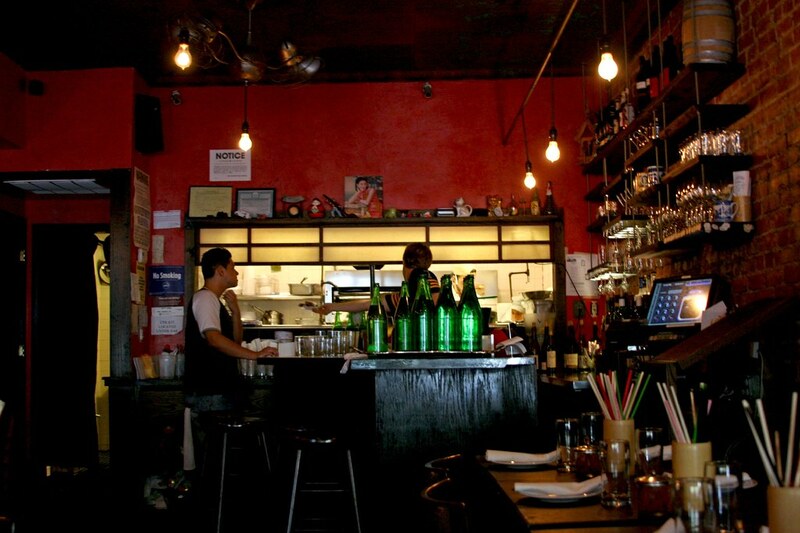 The music was loud and thumpin’ in a good way, that it gives it a cool, youthful vibe with a neighborhood feel of a restaurant. Once everyone arrived, we all introduced ourselves and started to look at the menu. After chatting a bit and contemplating amongst each other what the heck we want to eat, we eventually decided on the Quail Egg Shooters, Fatty Tea Sandwiches, the Watermelon Pickle and Crispy Pork Salad, the Green Mango Salad, and their house specialty, the Chili Crab. The Green Mango salad arrived first to our table. 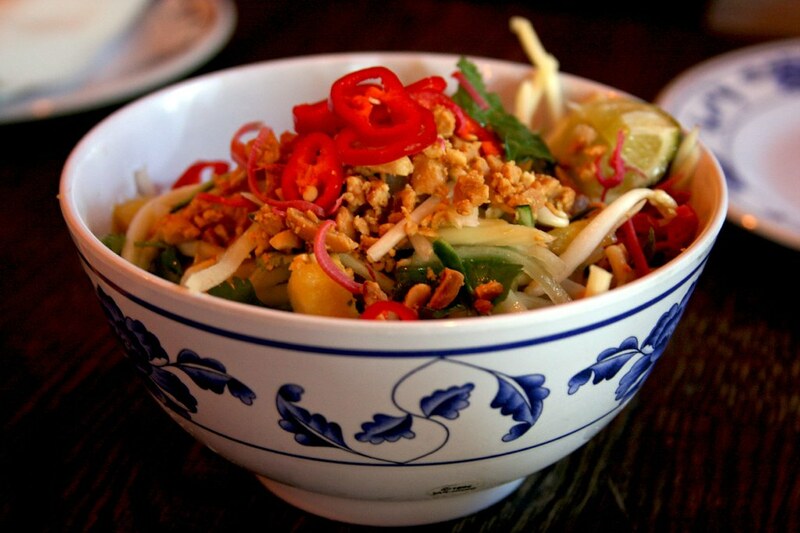 This salad is composed of crunchy, shredded green mango, chili and bell peppers, bean sprouts, some shredded pineapple, and crushed toasted peanuts to top it all off. Quite tasty. It had a subtle spicy kick at that one would feel in the back of the throat, some tartness from the lime, and a sweet burst from the pineapple. The pineapple was the favored ingredient from the table. 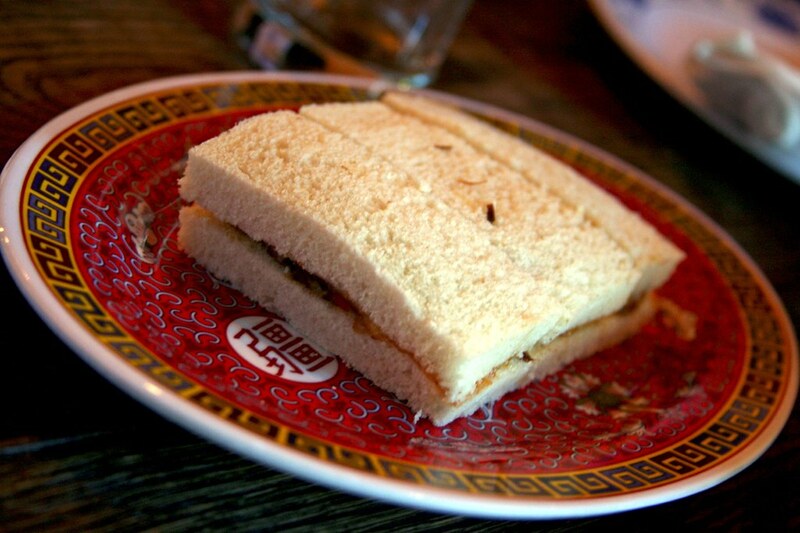 While we’re eating our aforementioned salad, the tea sandwiches graced our table. It’s done the proper English way, superficially: crustless, untoasted, white bread filled with well, something. But that “something” is actually one of the best fillings I’ve ever encountered in a while, it’s slathered with a thick sambal aioli, shreds of pork belly, and cilantro leaves to give it some pungent kick to contrast the strong, heavy flavors of the mayo and pork. Yums. Shortly thereafter, the dainty, artfully presented Quail Egg Shooters arrived. Everyone was in awe of that particular dish, and I was struggling to hear the server what were in these eggs since he was on the other side of the table, while the music was blasting. Anyways, from what I observed, these eggs reminded me vaguely of what I had in Le Bernardin a few years ago (the fluke ceviche tasting), where each shot got more complex in flavor as you progress onto the next shot. In terms of the quail eggs, it’s complex by adding more toppings. Since I don’t have the entire dish to myself, I just ate the second most complex egg shot of the rest (topped with sambal, dried anchovy, I think?, and dried pork floss), while Ariel had the most complex (the kitchen sink of toppings), Jess had the second most (poached quail egg with sambal and a dried anchovy), and Adam had the simplest one that contained the poached egg with a squirt of sambal. So cute and pretty (well, sorta on the latter)! We all took our miniature eggs and toasted with them. I don’t know why exactly, but Ariel proposed to do so and we all did it without cracking a shell, thankfully. 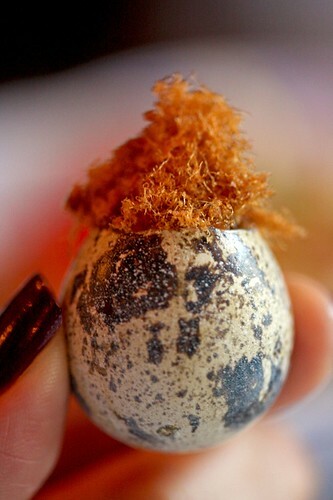 If you’re wondering how it’s like eating that quail egg, it’s like eating a poached in its shell, microscopic size of a chicken egg that is still warm and gooey with a touch of saltiness from the pork floss and the dried anchovy, and a touch of spiciness from the sambal. It’s very comforting to feel the warm, viscous egg yolk enrobing the entire palate. 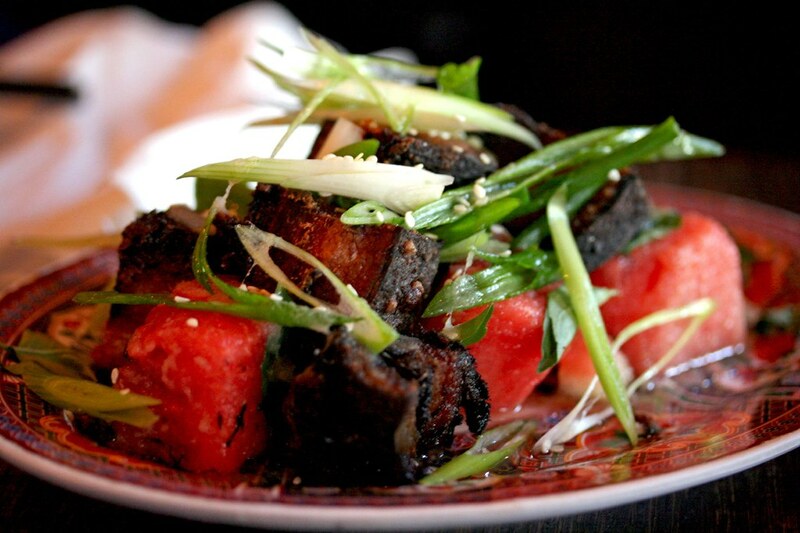 Moving on to my highlight of the meal, the Watermelon Pickle and Crispy Pork salad. I’ve read so many praises and many foodies tell me that I must try this dish if I went there so, this was the only dish I was really adamant to be ordered, while there were a few grimaces from the others while we were reading it off the menu. But since it arrived on our table, their minds changed. The seeded watermelon was very juicy and gingery, not the pickle I was thinking of initially, and it finished off with that watermelon sweetness. Eating the crispy pork alone, would make me wonder if it would work well since each chunk was half fat and half meat, and quite charred. The pork meat was a bit dry and overcooked but if one eats it together with the watermelon, then it works out well, since if we had the silky smooth pork flesh, it would compete with the soft, juiciness of the watermelon. Very delicious. 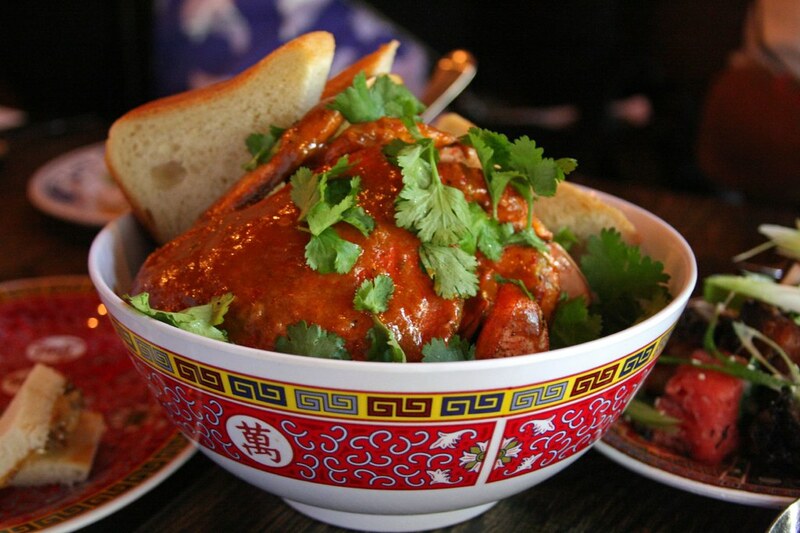 Then the most expensive item we’ve ordered from the menu (and it is the most expensive on the menu), is the Chili Crab for the market price of $36. Initially we were all hesitant on getting something with that price tag but I don’t mind paying for it, as long as it’s worth it. And worth it it was. 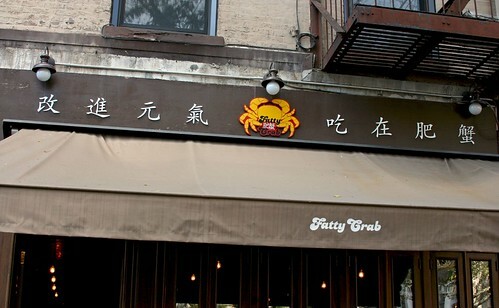 As you can see from the above photos, the crab looks (and is) huge! This large crustacean was coated in a red, spicy sauce probably made with sambal, garlic, probably some of the crab’s meat and innards, and tomato paste. That sauce alone made me swoon. 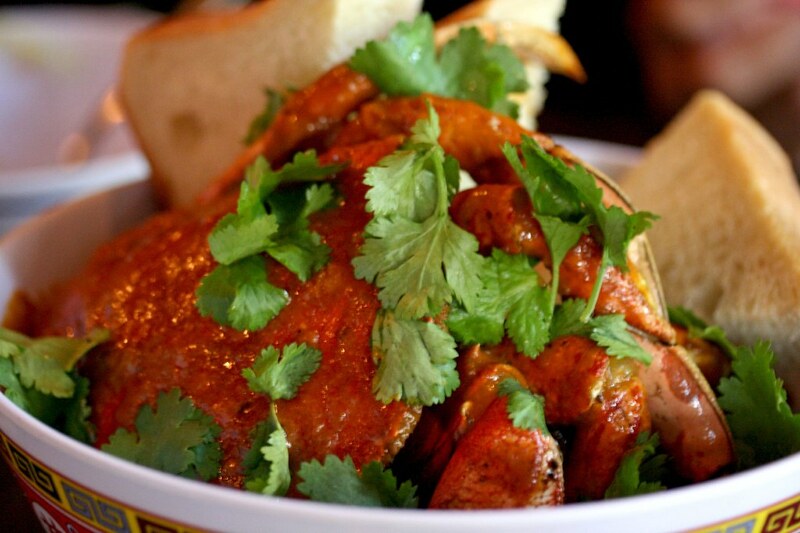 I don’t mind eating buckets of it with some toasted white bread and I’ll still be a happy camper…er…diner. Anyways, the crab was obviously a task in itself, while we all hacked, cracked, and forcefully get our meat with bits of shell flying all over the place. But it was fun and we’re kind of interacting with our food. The crab tasted a bit dry, in my opinion, since it’s been a long time since I ate one. Actually, I haven’t eaten a real crab since I accidentally ate one when I was 8 years old and had an allergic reaction to it. But thankfully, after ingesting the small portion of its head and one of its claws, nothing happened except my content belly filled with crab innards, that yummy sauce, and toast. Once we’re finished eating, we stayed there a bit longer discussing about our lives in general, and Ariel’s and Adam’s wonderful expeditions outside the country. 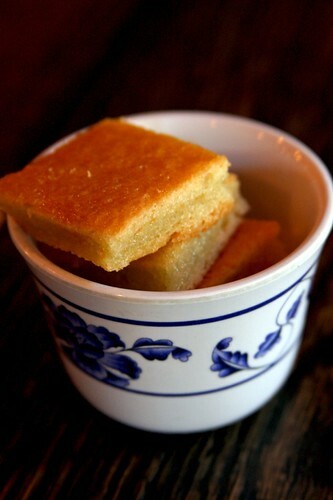 Eventually the check arrived with a cup filled with little cornbread look a-likes. These little squares are actually corn rice cakes. No, I’m not talking about those dry health food stuff, I’m talking about the glutinous, chewy version of a rice cake. It’s packed with corn flavor, not too sweet, and it smells like cornbread. Not bad and interesting flavor choice. After munching away, we’ve paid the check and walked outside. I’ve asked Jessica and Adam, what are they going to do afterwards, she said they’ve been on a bread tasting tour. From what I remember them telling me, they’ve been to Balthazar and a couple of other bakeries that Adam’s quite full now. But since Jess was still determined in trying or finishing out her extensive list that she printed, the next stop would be Amy’s Bread. I told her it’s very close by, since we’re blocks away from Chelsea Market and I had more time hanging out here, so off (the entire group) we went. As we approached Chelsea Market, to my initial shock, no one has been there before. I could understand Jess and Adam since they’re interning in NYC from Cornell but Ariel? 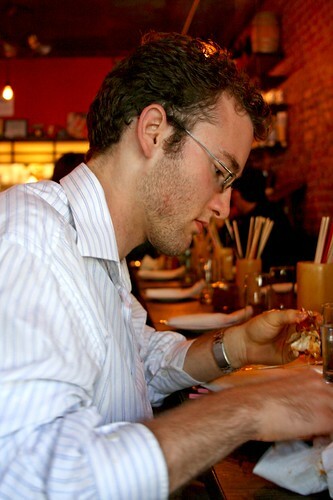 He’s been a NYC resident for nearly a decade and somehow, he hasn’t been here before. So, I gave them a brief tour of sorts about where my usual shops I would go and led them to the tiny gelato stand, L’Arte Del Gelato which is right inside the Bowery Kitchen store. Most of us were indecisive, sampling a few flavors to make up our minds. Eventually, we all got our desserts and stepped out where there were some standing space in the Market. Jess got herself a small cup of hazelnut and coffee gelatos, which I haven’t tried but I ate them before so, I know the flavors are quite potent. Ariel got the biscotti and gianduja; again, I haven’t tried but, I had the gianduja last week and it tasted fine. 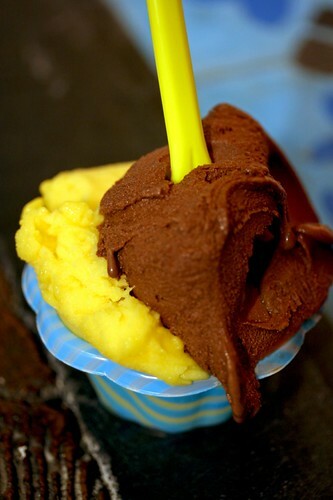 Me, on the other hand, went a bit traditional in flavor pairing: chocolate gelato with a passion fruit sorbet. The chocolate was alright. It’s chocolatey but I had a better version at Grom a while back. The passion fruit sorbet was really potent, tart, and smooth. It’s a great contrast to the sweet, creamy chocolate. Why are you at staring me like that?! 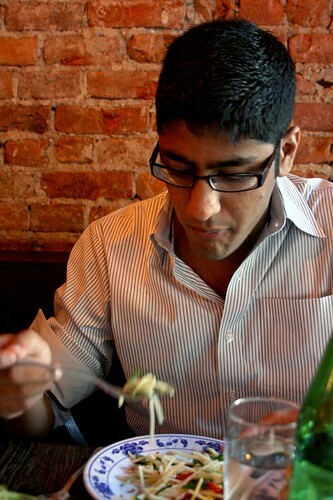 To explain the caption on the last photo, it should be assumed that Ariel would be jaded with me taking photos of people who I eat with…and he’s no exception. But alas, it seems like it’s a new thing to him. Once we’re done with our dessert we walked over to Amy’s Bread for the sake of Jessica’s tasting and eventually, parted ways as we all say goodbye and Ariel gave the entire group a bone-crushing bear hug. It was really fun hanging out with everyone! I just wish I had more time before I had to go to a family outing…eh. good palate – it is fage. but the jam in the parfait was orange marmalade. it’s now on to concord grape. Sam: Damn, you’re fast. I should hone my palate a bit more on the jams. But thanks for correcting me and shall correct it on the post. Awesome post! 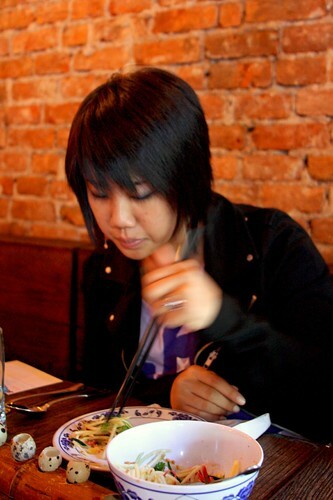 =) I especially liked the crab dish – made me realize how long it’s been since I’ve had any crab or lobster. The corncakes look exactly like a local hawaiian snack called ‘butter mochi’! oohhh man, sooo delish! the parfait looks delish – im a big fan of the yogurt parfait – it like eating a bowl of cereal but not…don’t know where I’m going with that comparison – but you get the idea. I haven’t been hitting up the gym as regularly as usual – perhaps you’re making up for my laziness. With any luck I’ll be back in action soon. Yes! We must go fooding of some sorts with Robyn that has to do with sweetbreads (too many places to name that are pretty good), as for spatzle (go to Cafe Sabarsky, it’s very delish). Gnocchi…I haven’t tried that many Italian places but the given are Babbo, or any Batali establishment. Jess: Oh, I wish I had more time to do…EVERYTHING. The academic owns me…and eventually the corporate and it all trickles down on to the federal government (via taxes). Doug: Well, it being from Bouchon, it should look pretty! But I know where you’re going with the cereal analogy: it’s like having a creamy. 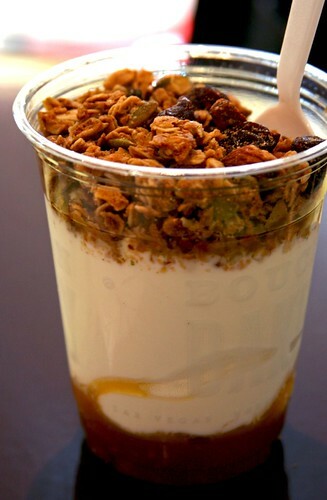 semi-solid milk with granola “cereal” bits on top with a jam surprise on the bottom…or something like that. And waay more tastier than I just said. Eh, with midterms this week, I’m not going to the gym as much as I should…but I’m trying to sneak in an hour or two before classes. Yay! You’re coming! :D You can bring your significant other too, ya know…that’s if she wants to come. Chubbypanda: Really? It’s not as expensive as my macro? But I looove my new lens, anyways. Maybe ask for an early birthday or Christmas present! Yeah…maybe? A pumpkin cream filling? 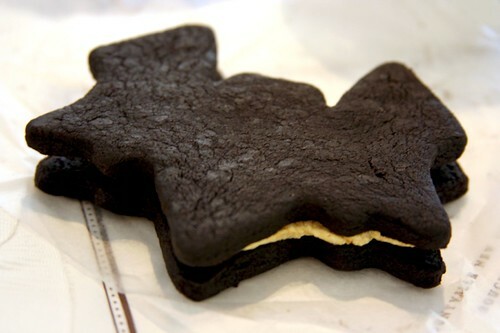 Wow, I need to make that because no one here sells anything similar as a cookie filling. 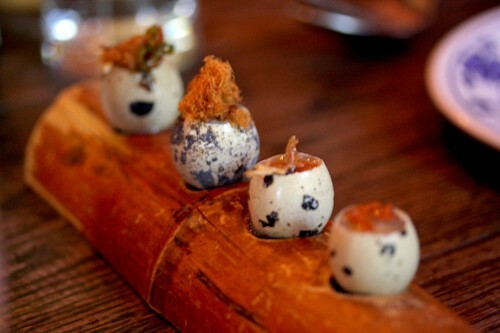 The quail egg shots sound really good. I think the anchovy is a great touch (that and how each progresses), I guess that’s because I like anchovies.